During the time of the discovery of America, most of the conquerors were males. However, there were also women, who for years they went unnoticed for the official historiography. Among them, there stands out Isabel Barreto de Castro. According to the chronicles, she was born in Pontevedra in 1567 – she was baptized in the parish of Santa Maria la Mayor. Since she was a young girl, she stood out for her restless spirit, and ended up embarking on the adventure of the New World. She left for the City of Reyes (present Lima) together with her family in 1585 and there she met the elderly Alvaro de Mendaña, with whom she got married. The islands have been inhabited for thousands of years. 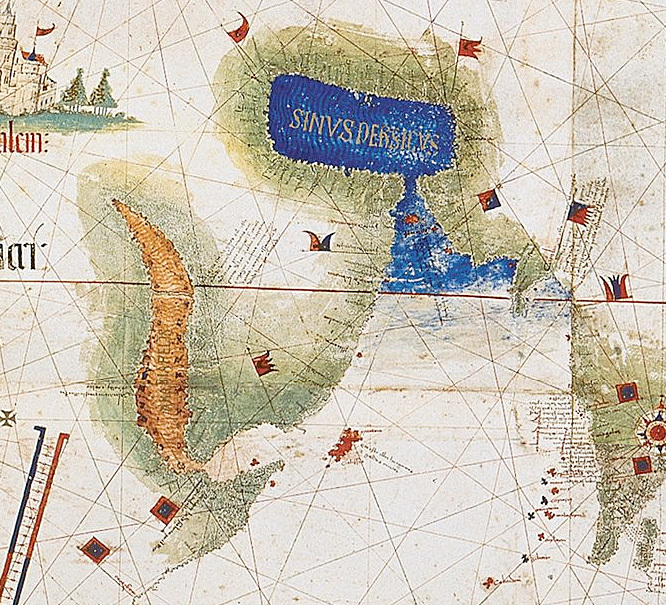 In 1568, the Spanish navigator Álvaro de Mendaña was the first European to visit them, naming them the Islas Salomón. This is how Isabel de Barreto became the first female admiral of the Spanish Navy, as owner and mistress of the Santa Isabel galleon. According to documents of the time, the cruelty of the new admiral cost the hanging of several sailors that had contravened her orders. Again, in words of Quiros, was “of manly character, authoritarian, untamed, will impose her will despotic to all who are under her I send”. Isabel, accused of cruelty by the crew, demonstrated a strong personality with great leadership and great determination. She had an uncompromising attitude and managed to maintain severe discipline of the crew of tough and adventurous men, always willing to conspire and mutiny. Subsequently, Isabel set course to the Philippines, where he contracted second marriage before returning to the viceroyalty of Peru. She remarried to general Fernando de Castro, again crossing the Pacific Ocean to Mexico, and then settled in Buenos Aires, where they lived for several years, before returning to Peru. It is said that Isabel crossed the Atlantic Ocean for the last time to Spain to defend her rights over the Solomon Islands, because the King had granted the right to colonize the islands to Pedro Fernández de Quirós. She may be buried in Castrovirreyna (Peru) or in Galicia (Spain), in 1612. El Callao, April 9, 1595. Las Marquesas de Mendoza (Marquesas Islands), July 21 – August 5. San Bernardo (Pukapuka, Cook Islands), August 20. La Solitaria (Niulakita, Tuvalu), August 29. La Huerta (Tomotu Noi), Recifes (Swallow Islands), September 8. Santa Cruz (Nendö, Santa Cruz Islands), September 8 to November 18. They attempted to found a colony, where Álvaro de Mendaña died, October 18. AM-34RN (4 X 970hp) – MTOW 22,600kg (49,8201b) – Normal Range 1,350km (840mi) – 12 SEATS. 180km/h (112mph). A special feature in the design was a tunnel that permitted air mechanics to crawl along the whole length of the wing, to inspect fuel tanks and cargo holds; and on one notable occasion, this was used to perform some unusual maintenance on one of the engines. Bill Gunston, renowned technical aviation authority and compiler of encyclopedic volumes about aircraft, including a masterpiece on Soviet types, says this about the Tupolev-designed ANT-6, also known as the TB-3 or the G-2: “This heavy bomber was the first Soviet aircraft to be ahead of the rest of the world, and one of the greatest achievements in aviation history” and that, “the design was sensibly planned to meet operational requirement and was highly competitive aerodynamically, structurally, and in detail engineering.” This was in 1930. Give or take a ton or two, depending on the version, the ANT-6 weighed, fully equipped for take-off, about 22 tons. Most G-2s weighed 22,050-kg (48,500-lb). By comparison, the contemporary German Junkers-G 38 weighed 24 tons, but only two were built, compared with no less than 818 ANT-6s. Of these, the vast majority were for the Soviet Air Force, painted dark green, with sky blue undersides; about ten or twelve ANT-6s were allocated to Mark Shevelev’s Polar Aviation (Aviaarktika), and painted in the orange-red and blue colors. The four special versions prepared for the Papanin expedition, according to Tupolev historians, were in bare metal, probably to save precious weight. The British and French industries had nothing in the same league, and the U. S. A. had not yet thought of the B-17. Too Designed primarily as a bomber, the type was adapted for other purposes. Design started way back in May 1926, wind tunnel testing was completed in March 1929, and Mikhail Gromov made the first test flight on 22 December 1930. Throughout its lifespan (production ceased early in 1937) it underwent many improvements, culminating in the ANT- 6A, specially modified for Dr Otto Schmidt’s Aviaarktika’s assault on the North Pole; and it was also used during the 1930s by Aeroflot, reportedly carrying as many as 20 passengers. To equip the Papanin Expedition, every ingenious precaution was taken to avoid superfluous weight. Tents were of light-weight silk and aluminum. Utensils were of plastics or aluminum. The aircraft ladders were convertible into sleds. Special equipment such as the sounding line and the bathymeter were re-designed to save weight. Both the aircraft crews and the members of the expedition were eternally grateful for the innumerable contributions made by the ‘backroom boys’ in Leningrad, Moscow, and other sources of equipment supply. To carry even this finely tuned total weight of nine tons, divided between the four ANT-6 load-carrying aircraft, extra fuel also had to be taken, in addition to the provisions listed in the tables on this page. Almost two tons extra had to be carried by each aircraft. But the dome-shaped airfield on the plateau at Rudolf Island offered shallow slopes, down which the departing aircraft could gain speed and lift; and every item of nonessential equipment was stripped from the interior, and every non-essential item of personal effects was left behind. Landing a 24-ton aircraft on an ice-floe, no matter how big, was a speculative proposition. It was determined that the minimum ice thickness required was 70-cm (2-ft); engineers then devised a 9.5-kg (21-lb) ‘bomb’. It was shaped like a pear and fastened at its rear or trailing end was a 6-8-m (20-ft) line with flags attached. If the ice was less than 70-cm, the ‘bomb’ went straight through. If more, it stuck, and the flags, draped on the ice, indicated that landing was possible. This method was first utilized on the Papanin expedition. The Preparations Aviaarktika had already reached ever northwards during the late 1920s and had spread its wings far and wide across the expanses of the Soviet Union, in those areas where Aeroflot had no reason to go, for lack of people to carry in a vast mainly frigid region that was almost completely unpopulated, except for isolated villages and outposts. Rather like expeditions on the ground, such as those to the South Pole, Otto Schmidt, assisted by his deputy, Mark Shevelev, pushed further beyond the limits, very methodically. The northernmost landfall in the Soviet Union is the tiny Rudolf Island, an icy speck on the fringes of the island group known as Franz Josef Land (named after an Austrian explorer). At a latitude of 820 North, Rudolf is only about 1,300km (800mi) from the Pole and a good location for a base camp and launching site. 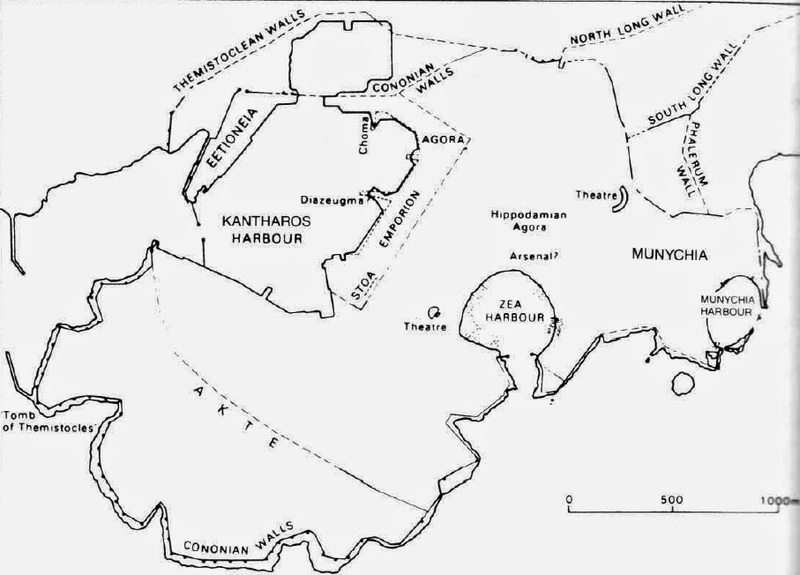 Access to Franz Josef Land, while hazardous because of the severe climate and terrain, is feasible as the twin-island territory of Novaya Zemlya accounts for about 800km (500mi) of the distance from the Nenets region. On 29 March 1936, Mikhail Vodopyanov set off with Akkuratov in a two-plane reconnaissance of the possible air route to Rudolf Island. Flying blind for much of the time, and having to contend with inconveniences such as boiling six pails of water before starting the engines with compressed air, they reached their destination, and reported that the conditions, while not ideal, were not impossible. On his return to Moscow on 21 May, Schmidt was sufficiently satisfied to make plans. He arranged for the ice-breaking ship Rusanoll to carry supplies to Rudolf, appointed Ivan Papanin to lead the assault on the Pole, and selected a combination of four ANT-6 (G-2) four-engined bomber transports, and one ANT-7 (G-l) twin-engined aircraft for the task. Vodopyanov was to be the chief pilot. The working party sent to Rudolf did their work well. In addition to setting up a base camp and a small airstrip on the shoreline, they rolled out a longer runway, with a slight slope to assist take-off, on a dome-shaped plateau about 300-m (I,000-ft) above the base camp. The squadron of aircraft flew up from Moscow, leaving on 18 March 1937. Reaching Rudolf, they began final preparations. The ANT-6s were estimated to need 7,300-liters (1,600-USg) of fuel for the 18-hour round-trip to the Pole, and 35 drums were needed for each aircraft. Ten tons of supplies of all kinds were to be taken, and elaborate steps were taken to design light-weight and multipurpose equipment. There were frustrating delays, as they waited anxiously for Boris Dzerzeyevsky, the resident weather-man, to report favorable conditions, and for Pavel Golovin, pilot of the ANT-7 reconnaissance aircraft, to confirm Dzerzeyevsky’s forecasts, and to test the accuracy of the radio beacons. On one flight, Golovin was stranded for three days when he had to make a forced landing on the ice. But eventually, the expedition received the all-clear. Flying an ANT-6 (registered SSSR-NI70), Mikhail Vodopyanov, with co-pilot M. Babushkin, navigator I. Spirin and three mechanics landed at a point a few kilometers beyond the North Pole (just to make sure) on 21 May 1937, at 11.35 a. m. Moscow time. Ivan Papanin, with scientists Yvgeny Federov and Piotr Shirsov, together with radio operator Ernst Krenkel, immediately established the first scientific Polar Station (PS-l) on the polar ice, on which they eventually drifted on their private ice-floe in a southwesterly direction until they were picked up off the coast of Greenland by a rescue ship on 19 February 1938. During the final flight from Rudolf Island to the North Pole, Mikhail Vodopyanov realized that one of the ANT-6’s engines was leaking water from its radiator, with its precious anti-freeze liqUid disappearing into thin air. Vodopyanov’s trusted chief air mechanic, Flegont Bassein, together with co-mechanics Morozov and Petenin, crawled along the tunnel in the wing (see opposite and diagram below) and tried to stop the flow. They came up with an ingenious solution, by placing cloths over the leak, soaking up the outflow, squeezing them out into a container, and pouring the liquid back into the radiator. The engine kept going. The mechanics did too, but barely. To reach the leak, they had had to force an opening in the leading edge of the wing, radiators obviously being exposed to the airflow. It was an act of fortitude that nearly cost them their hands. After the various great flights made by Soviet aircraft, the pilots and crew were lavishly decorated, receiving many medals and testimonials in the Soviet tradition. Moscow witnessed receptions that were as impressive, if not quite so lavish, as those bestowed in New York on Lindbergh, Earhart, or Hughes. And they were well earned. Mikhail Vodopyanov, for example, had built up hundreds of hours of flying in remote parts of Russia, including the opening of the Dobrolet route to Sakhalin. He had pioneered the route to Rudolf Island, and had campaigned for aircraft landings on the North Polar ice, in opposition to other views that the Papanin party should be dropped by parachute. His crew members Mikhail Babushkin and Ivan Spirin had both flown big airplanes as early as 1921, in the Il’ya Murometsy, no less. Vasily Molokov had been one of the heroes of the Chelyuskin rescue, and his radio operator had been with him on the long Siberian circuit. Anatoly Alexeyev had flown on a relief party to the Severnaya Zemlya islands in 1934; while lIya Mazuruk and Pavel Golovin already had outstanding records. When the Soviet Union decided to Go For The Pole, it had the best cadre of trained and experienced pilots in the world to face the daunting challenge. Many motives drove Christopher Columbus to sail west toward the Indies, but one purpose that drove the westward voyage of this complex and often inconsistent man was the dream of converting the Great Khan of Cathay and joining with him in a final, great, and successful crusade against Islam, which in turn would usher in even greater events. In his so-called Book of Prophecies, a compilation of texts prepared essentially between 1501 and 1505 for the Catholic monarchs of Spain, Fernando and Isabel, the master mariner placed the discovery of the Indies into the grand divine plan for the forthcoming salvation of all humanity, the Final Judgment, and the End of Time. He argued that his voyage to the west had been the first step in the process of liberating Jerusalem, itself a necessary step in the unfolding of God’s plan of universal salvation. Leaving aside the issue of whether or not he actually believed these messianic prophecies (and it seems clear that he did), it is clear that Columbus was appealing to a widespread belief that the road to Jerusalem lay through the Indies. After all, he was appealing to two crusaders, the Catholic Monarchs Isabel and Fernando, who had conquered Granada on January 2, 1492, and who saw victory over the last Muslim stronghold in the Iberian Peninsula as another stepping stone in their God-sanctioned struggle against Islam, a struggle that was foreordained to result in triumph. Even after it became clear that Columbus had not sailed to the Indies, at least some European churchmen continued to harbor the hope that the lands and peoples of the Americas would be the means for the liberation of Jerusalem and the destruction of Islam, and they apparently imparted that dream to at least some of their Indian converts. Festivals celebrating the victory of Christians over Moors became an integral part of Catholic religious culture throughout Latin America wherever Spanish and Portuguese missionaries brought the faith after 1492. Among these were the Tlaxcalans, whose religious pageants offer an important example of how thoroughly Catholic Christianity was assimilated in the New World. The Tlaxcalans, themselves Nahuatl but nevertheless traditional enemies of the Mexica and their Aztec empire, had been defeated by Hernan Cortés in September 1519, and following that defeat they allied with the Spaniards in their march against the Aztec empire. Thousands of Tlaxcalans participated in the fighting and proved to be a decisive factor in the Spanish victory. A number of Cortés’s lieutenants married Tlaxcalan women of high birth, and despite initial reluctance to give up their ancestral deities, the Tlaxcalan chiefs were baptized as Christians sometime after July 1, 1520. Mock battle pageants between “Christians and Moors” had been a popular expression of Reconquest realities and ideology in the Iberian Peninsula since at least the late thirteenth century. Now they were translated to the New World and its Christian converts. We are fortunate to have a description of a Corpus Christi pageant performed by the Christian Indians of Tlaxcala in 1539 to celebrate the peace treaty between Emperor Charles V and the king of France and recorded shortly thereafter by the Franciscan missionary Fray Toribio de Benevente Motolinia in his History of the Indians of New Spain. In this elaborate pageant, which was composed at least in part by the Tlaxcalans but clearly with the help of their Franciscan mentors, the playwrights portrayed the future conquest of Jerusalem by the combined armies of Charles V’s European possessions and New Spain and the consequent baptism of its presumed occupier, the Muslim sultan of Cairo (although, in fact, Jerusalem had passed into Ottoman hands in December 1516). Significantly, the pageant included several large and spirited mock battles, which apparently served to underscore the fact that holy war and the festivals that celebrated divinely mandated conflict and bloodshed were as much a part of this new religion of the Tlaxcalans as they had been when they and other Mesoamerican tribes conducted “Flower Wars,” preconquest battles fought for the purpose of capturing enemy warriors who were then sacrificed to a local deity. Often the sacrifice was either preceded by or took the form of a mock battle, when the captive was given an ineffective wooden sword with which to battle a fully armed adversary. The most striking aspect of this pageant and its mock battles is that all of the combined crusader forces, European and Indian, fail to take Jerusalem despite their bravery. The Christians only succeed when the combined Indian forces of New Spain are joined in the fray by a heavenly patron on a brown horse, Hippolytus, a third-century soldier-saint on whose feast day, August 13, 1521, the Spaniards and their Tlaxcalan allies had captured Tenochtitlan. Indeed, just as the Tlaxcalans are led by Saint Hippolytus, the Spaniards, who now sweep to victory alongside these new Christians, are led by Santiago Matamoros- Saint James the Moor-slayer-on a horse “as white as snow.” Significantly, Santiago was the patron-saint of the Reconquista, the crusading wars of reconquest waged by Christian Iberians against the Muslims of Spain from roughly the mid-eleventh century to late fifteenth century. According to legend, the apostle Saint James the Greater, whose relics were believed to have been miraculously transported to Compostela in northwest Spain, had initially appeared to lead the Christian forces of Asturias to victory at the mythic Battle of Clavijo in 844. He was also the namesake of the Order of Santiago, the most powerful of the Iberian military orders, founded in 1170 in Leon. Significantly, Hernan Cortés, the conqueror of Mexico, belonged to that order, as did many of his subordinates. And we are told by the sources that these conquistadors regularly shouted out the traditional Spanish battle cry, “Señor Santiago,” as they went into battle in the Americas. The meaning of this Tlaxcalan pageant is clear. There is every reason to conclude that the Tlaxcalans were anxious to present themselves, and fellow Nahuatl converts to Catholicism (including their former enemies, the Mexica), as latter-day crusaders and as having accepted totally the Spanish crusading ethos despite whatever animosities they still harbored against their conquerors. Moreover, the Tlaxcalans were fully aware, as were the Spaniards, that Cortés’s small army of Spanish soldiers could never have conquered the Aztec empire without the tens of thousands of Indian allies who marched with him, and chief among these were warriors from Tlaxcala. As a consequence, Tlaxcala became a privileged, largely self-governing province under Spanish colonial rule and was showered with honors and privileges. The ideology of crusade was such a driving force in the Spanish conquest of Mexico that even the conquered and converted felt it necessary to claim identity with it. And what sort of crusade was that? By 1500, indeed well before that date, the crusade had metamorphosed into a struggle of apocalyptic proportions and with deep millenarian overtones. Put simply, it was a global, even cosmological, struggle between Catholic Christendom and Islam, heresy, heathenism, unbelief, and every manner of error, which included the “heathen errors and practices” of preconquest Mesoamerica. Bibliography Gillespie, Jeanne. Saints and Warriors: Tlaxcalan Perspectives on the Conquest of Tenochtitlan. New Orleans: University Press of the South, 2004. Harris, Max. Aztecs, Moors, and Christians: Festivals of Reconquest in Mexico and Spain. Austin: University of Texas Press, 2000. Matthew, Laura E., and Michel R. Oudijk. 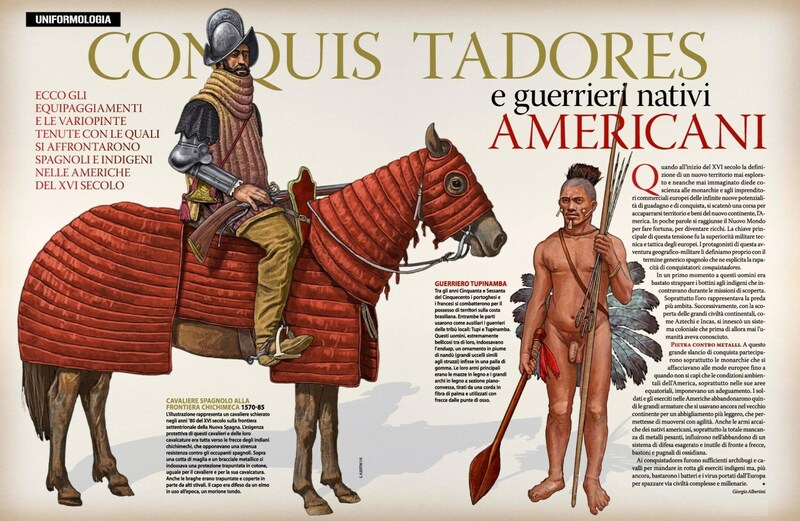 Indian Conquistadors: Indigenous Allies in the Conquest of Mesoamerica. Norman: University of Oklahoma Press, 2007. Motolinia, Toribio de Benevente. History of the Indians of New Spain. Edited and translated by Francis Borgia Steck. Washington, DC: Academy of American Franciscan History, 1951. Map of the Arabian Peninsula showing the Red Sea with Socotra Island (red) and the Persian Gulf (blue) with the Strait of Hormuz (Cantino planisphere, 1502). A replica of Flor do Mar, Maritime Museum of Malacca. Atlantic European states did not wait until they achieved complete technical predominance at sea to begin their maritime expansion. In the fifteenth century, maneuverable, open-ocean-capable, long ranged sailing merchantmen, armed with enough cannon to fight off galleys, navigated the seas and enormously expanded European commercial horizons. The Portuguese were among the first to put the new technology to use. 16 Early in the fifteenth century they reached the Madeiras, the Azores, and the Canary Islands. By midcentury they had worked their way down the coast of West Africa as far as Senegal. In 1487 Bartolomeu Dias rounded the southern tip of the African continent-the Cape of Good Hope. Ten years later Vasco da Gama returned to the Cape, entered the Indian Ocean, and sailed as far as Calicut. By the end of the first decade of the sixteenth century, the Portuguese were fighting their way, not always with success, into the enclosed waters of the Red Sea and the Persian Gulf. 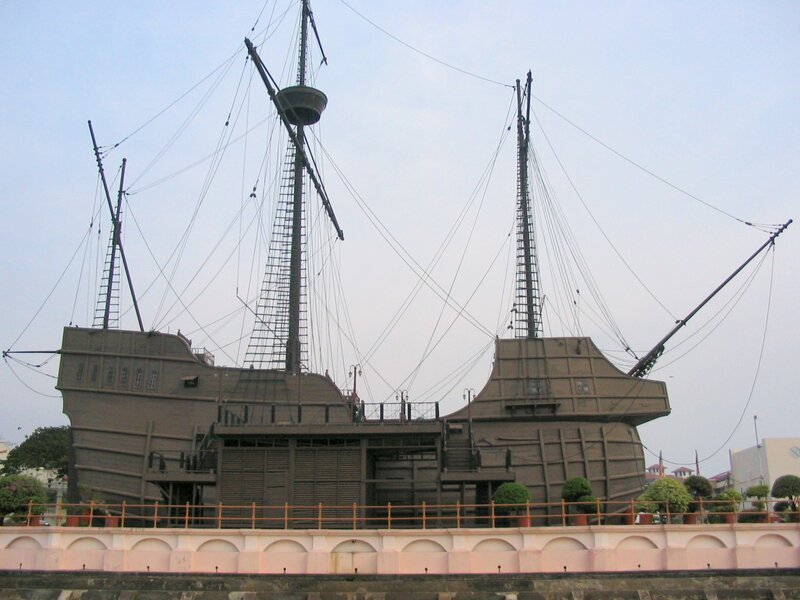 In 1513 their first ships reached China, and in 1557 the Portuguese established themselves at Macao. The Portuguese confronted the reality of the maritime revolution as they rounded the African cape and sought first markets and then dominance in the Indian Ocean basin. Portuguese commanders were quick to grasp the relevant geography of the region and identify all the choke points, where ships had to traverse narrow waterways: the Cape of Good Hope, the Bab el Mandeb at the entrance to the Red Sea, the Strait of Hormuz at the entrance to the Persian Gulf, and the Strait of Malacca through which the trade of India, the Indies, and eastern Asia passed. The Portuguese believed that if they could control these points, along with centrally located, fortified bases on the Malabar coast of India, they could destroy and disrupt local commercial traffic, divert the region’s trade to their own routes, and outflank and economically undermine the Islamic powers, especially the Ottoman Empire. The Portuguese developed and executed a three-phase strategy. First, they quickly disposed of the navies of the Arabs and other regional powers, winning a major naval engagement off Diu in 1509. Second, they conducted a series of raids to destroy local merchant shipping. Third, under the direction of commanders such as Afonso de Albuquerque, captain general and governor of India between 1509 and 1515, they attacked several critical strategic points: they seized the island of Socotra near the entrance to the Strait of Bab el Mandeb (1507), Muscat and the island of Ormuz in the Strait of Hormuz (1508), and the approaches to the Strait of Malacca (1511), but failed to capture Aden (1513) and Jiddah (1517). The ambitious and largely successful plan disrupted, but failed to halt, commercial activity along the Red Sea and Persian Gulf routes, and diverted a great deal of traffic to the new routes opened and controlled by the Portuguese. The Portuguese were nevertheless unable to consolidate their gains. Economic warfare did undermine the smaller local powers, such as the Mamluk regime in Egypt, but generally to the profit of their larger, more powerful Islamic neighbors, such as the Persians and the Ottomans. Portuguese successes induced the Ottomans to reinforce their southeastern sea flank; they checked the Portuguese at Jiddah in 1517. The Ottomans continued their naval buildup and launched several counterattacks, in the Red Sea in the 1530s and in the Persian Gulf in the 1550s. Despite some successes, the effort failed to break the Portuguese grip on the western basin of the Indian Ocean. 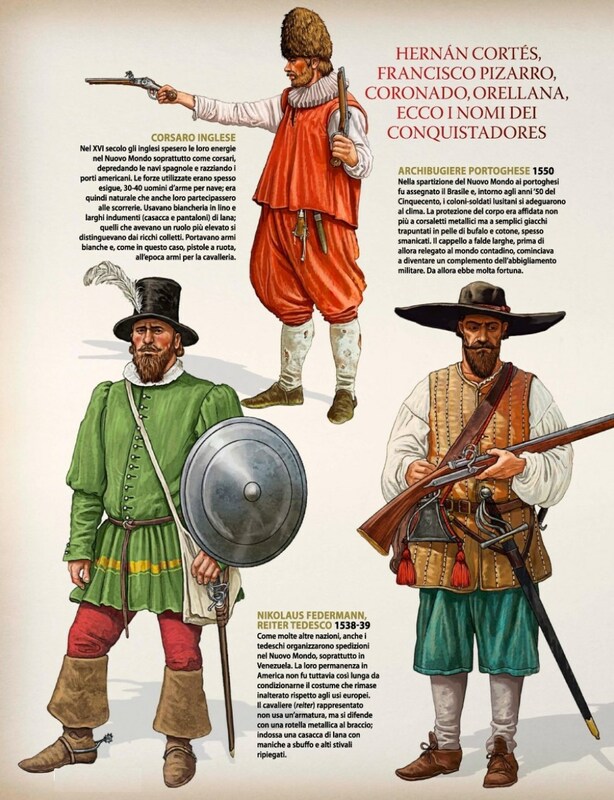 There was also a third key to Portuguese success: loyal and able commanders willing to act on their own initiative and monarchs willing to trust those they picked for command. Until the invention of the telegraph in the mid-nineteenth century, states had little choice but to grant commanders operating on distant stations wide powers, often including not only military but also diplomatic and economic responsibilities. Fleets or squadrons dispatched halfway around the world could not be controlled in the same manner as a fleet of galleys operating in concert with an army. Only on-scene commanders, such as d’Albuquerque, could direct the early-sixteenth-century Portuguese effort in the Indian Ocean. Portuguese officials in India were too far from Lisbon to receive or to seek direction or reinforcements. It took months to send correspondence back and forth between India and Portugal, and even longer to outfit and dispatch expeditions. Ships often departed for the Indies without knowing the fate of those which had sailed the previous year. The king had little choice but to appoint commanders he could trust and in whose abilities he had confidence. He would give such men general directions and substantial independent powers, and send them on their way. In the absence of communications, grand strategic command and control worked best if a state’s political and naval leaders shared an understanding of naval capabilities and long-range national goals. Since no state had ever before conducted sustained naval operations on a global scale, the process of developing this understanding was empirical. Throughout the sixteenth century the Portuguese, and other Europeans, gradually grasped the revolutionary change in the nature of sea power and developed concepts to guide the use of naval forces. The problem of the longitude, locating the east-west position of a ship on the open sea, was the classic technological problem of the early modern period, assaulted by many of the greatest scientists of the scientific revolution, including Galileo Galilei (1564–1642), Christiaan Huygens (1629–1695), and Edmond Halley (1656–1742). The great astronomical observatories founded in the period, most notably the Paris Observatory and the English Royal Observatory at Greenwich, had the solution of the longitude problem high on their agendas. All failed, leaving the problem for the eighteenth century. If anything, it was of increasing urgency, given the expansion of the territory covered by European vessels. As the celestial bodies seemed to rotate around Earth from east to west, they did not seem to offer a way to know one’s position on it. Existing methods, based on observation of the Moon, or simply estimating the speed one had been traveling for a given time, were maddeningly and even dangerously imprecise. Most approaches to the longitude reduced the problem to that of finding the difference between the time on the ship, set by observation of the Sun’s meridian at noon, and the time at a fixed point, usually that of the home port. The difference in time could be translated into spatial terms as the difference in longitude between the two points. There were all sorts of bizarre schemes for this, but the two main approaches were using astronomical events to give the correct time and creating a clock able to give accurate time on a ship. If the home-port time of a celestial occurrence were known, all that would be necessary would be to compare the ship’s own time on observation of the occurrence. For example, if the time when an eclipse would occur at a fixed point were known, all that would be necessary would be to compare the time that the ship’s navigator saw the eclipse, and the distance between the two points would be known. This method was limited in its uses, however, as eclipses were quite rare. Galileo’s idea of using the frequent eclipses of the moons of Jupiter became dominant in geography and cartography on land, but the difficulty of observing Jupiter’s moons from a moving ship made it difficult if not impossible at sea. The greatest eighteenth-century sea power, Great Britain took the lead in most eighteenth- century longitude schemes, although its colonial rival, France, was not far behind. Two unsuccessful longitude solvers, William Whiston and Humphrey Ditton (1675–1715), set forth a project in 1713 for the creation of a network of stationary ships over the seas, whose crews would fire guns at designated times, enabling passing ships to set their distances by factoring in their knowledge of the speed of sound. This idea was impractical on many levels, and never seriously considered. Whiston and Ditton’s lobbying of the British Parliament for a more active approach to the problem along with London’s maritime leaders whom they had organized resulted in the Longitude Act of 1714. This act established a prize of 20,000 pounds for a solution accurate to half a degree of a great circle around Earth; 15,000 pounds for a solution accurate within two-thirds of a degree; and 10,000 for a solution accurate within a degree. It also set up the Longitude Board whose ex officio members included the astronomer royal, the president of the Royal Society, and the first lord of the Admiralty, among others. The board disposed of funds to encourage promising ideas and was the first great institutional patron of science. It was deluged with solutions, most of them crackpot, and for the first decade and a half of its existence never met and concerned itself with little beyond sending out rejection letters. The French Royal Academy of Sciences meanwhile had used a bequest from the magistrate Rouille de Meslay to set up a prize of 125,000 livres for the longitude and other improvements in navigation, and were considerably more active, awarding 2,000 livres in 1720. Serious eighteenth-century longitude ideas divided into two categories: the creation of an accurate shipboard clock and the astronomical method known as “lunar distances.” Lunar distances rested on the invention of a new astronomical instrument, the octant. This happened twice in 1731, with the independent work of the Englishman John Hadley (1682–1744) and the Philadelphian Thomas Godfrey (1704–1749). An arrangement of mirrors enabled a navigator to hold the distances between two celestial objects steady, even on the deck of a rolling ship. By observing the angular separation of the Moon and a given star, then comparing the time of observation with a table giving the times when that angular separation would appear from a fixed point such as London or Paris, the navigator could get the time differential and thus the longitude. All this plan required were accurate, mathematically skilled navigators and accurate tables of the extremely complex lunar motion, and legions of astronomers all over Europe set to work to provide the latter. Although the English and French scientific establishments poured effort and money into the project, the most accurate tables were the work of a German, Johann Tobias Mayer. Mayer’s death prevented him from claiming the prize, although his widow received 3,000 pounds from the board. By comparison, the clock idea was somewhat old-fashioned. The leader in the creation of a navigational clock was a self-taught English clock maker of genius named John Harrison (1693–1776), who worked outside the London-based English clock-making establishment. Harrison had contacted Astronomer Royal Edmond Halley early in the project and enjoyed some support from the Longitude Board and the Royal Society. But he also faced opposition from a series of royal astronomers, including James Bradley and Nevil Maskelyne, who strongly favored lunar distances and were ex officio members of the Longitude Board, often supervising the trials. Harrison received several thousand pounds from the Longitude Board, at one point benefiting from the personal intervention of King George III (r. 1760–1820), but never won the prize he sought. The French, meanwhile, were also investigating the possibility of an accurate watch, led by the royal clock maker Ferdinand Berthoud (d. 1807). After shipboard watches were tested on voyages to Saint Domingue in 1769 and 1771, their use became common in the French marine. In England Harrison was pitted against Maskelyne, the greatest exponent of lunar distances, who Harrison believed applied unnecessarily stringent conditions to the tests of the clocks and did not care for them properly when they were in his custody. Maskelyne’s annual Nautical Almanac and Nautical Ephemeris, first published in 1767, with its associated lunar tables, was the best available and put the lunar-distance method on a sound footing. This idea originated in the work of the Frenchman Nicolas-Louis de Lacaille (1713–1762) in the 1750s, but the French had never followed up Lacaille’s work. They did publish a French translation of Maskelyne’s almanac, beginning in 1772, a project with which Maskelyne cooperated even while the two countries were at war. The British navy required its navigators to be certified as proficient in Maskelyne’s method, although this was not consistently enforced at first. Updated, Maskelyne’s works served the international navigational community into the early twentieth century. It is due to Maskelyne’s lunar tables that the meridian of the Royal Observatory at Greenwich became the determining point for world time. The lunar-distance method had the disadvantages of not being possible on moonless nights, and of requiring several observations and much tedious and difficult calculation. The chronometric method using timepieces eventually became the most common way to find the longitude. The problem was not the accuracy of the watches, particularly after Captain James Cook used a timekeeper based on Harrison’s on his second voyage, from 1772 to 1775, and enthusiastically testified to its merits (although he also praised Maskelyne’s almanacs). The difficulty was the cost of reproducing accurate timepieces. Late-eighteenth-century London watchmakers, most notably John Arnold (1736–1799) and Thomas Earnshaw (1749–1829), simplified Harrison’s designs and began mass production of accurate shipboard watches, which became the dominant way of finding the longitude by the 1820s. The Longitude Board itself was disbanded in the new Longitude Act of 1828. Its greatest prize was never awarded. References Howse, Derek. Nevil Maskelyne: The Seaman’s Astronomer. Cambridge: Cambridge University Press, 1989. Sobel, Dava. Longitude: The True Story of a Lone Genius Who Solved the Greatest Scientific Problem of His Time. New York: Walker, 1995. The trireme shipsheds of Zea reconstructed as a model in Piraeus Museum. 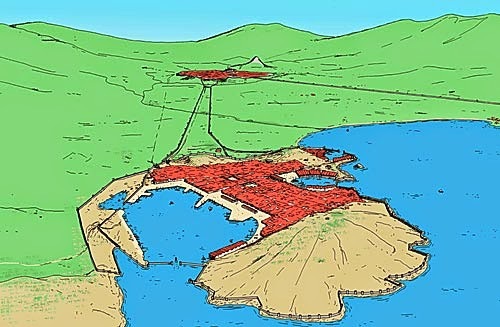 Reconstructed view of the three ancient harbours of the Piraeus: Kantharos (today the main harbour), Zea (also called Pashalimani in modern times) and Mounychia (modern Mikrolimano). Note the ship sailing through the fortified harbour mouth of Kantharos.